Short Business Description: A San Diego Based Web Site Development and Hosting Company with clients nationwide. Need a webmaster, developer or assistance on managing your web site? Call for free consultation. Want to upgrade to wordpress? Serving clients worldwide… Give us a call for any or part of your web site needs. 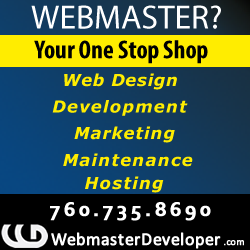 WebmasterDeveloper.com is your one stop shop. 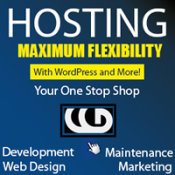 Hosting packages from only 7.95 a month and includes 10 email addresses and much more! Serving San Diego and clients nationwide. Webmasters, developers, graphic design, internet marketing, custom wordpress web site development and consultation. Consultation and training on how to manage or improve your web site. Call our project coordinator for a free consultation to discuss your needs and issues. Visit the web site for more details, signup for web hosting packages as low as 7.99 a month. Linux servers and more hosting options. Or call our project coordinators at (760) 735-8690 for a free consultation.